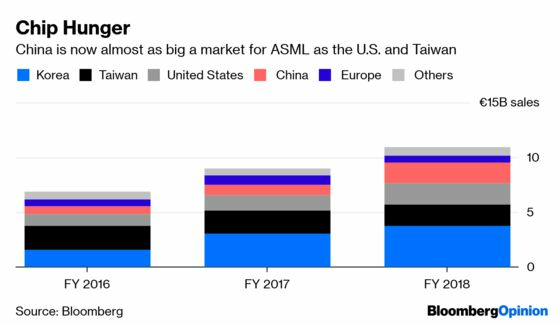 (Bloomberg Opinion) -- If you were compiling a shortlist of companies with the key building blocks for the next technological revolution, it would surely include ASML Holding NV. That’s why it’s particularly significant that the Dutch maker of semiconductor manufacturing equipment was the target of theft by a rival with alleged ties to the Chinese state, according to a report from Het Financieele Dagblad on Thursday. The Dutch newspaper said that ASML research and development employees in San Jose, California, passed internal documents over the course of several years to XTAL, a competitor whose parent receives state support. A U.S. court made XTAL pay $230 million in damages to ASML last year, but its links to the Chinese state weren’t clear at the time. ASML doesn’t enjoy the name recognition of an Apple Inc., Intel Corp. or Samsung Electronics Co. Ltd., but it is Europe’s second-biggest technology company by market capitalization. The world’s chipmakers buy its machines in order to manufacture the semiconductors that go into our smartphones, computers, cars and servers. ASML’s biggest customers are Intel and Samsung, as well as Taiwan Semiconductor Manufacturing Co. Ltd., which makes iPhone chips for Apple. The Dutch company has one serious advantage over rivals Nikon Corp. and Canon Inc. – it’s the only firm to have mastered next-generation extreme ultraviolet lithography. Lithography is the process by which circuit patterns are etched onto silicon wafers. The EUV process will allow the printing of circuits that are more than 10 times smaller than the current standard. The EUV machines cost more than 100 million euros ($113 million) apiece, and are starting to be delivered. The innovation could put off the day that Moore’s Law, which says that processing power doubles every 18 months, no longer holds true. That’s why the firm’s technology would be particularly attractive to China. The country aims to spend some $150 billion over a decade to assume a leading role in technology design and manufacturing as part of its “Made in China 2025” push. Although it is a hub for electronics manufacturing, assembling iPhones, laptops, smart speakers and more, a lot of the crucial underlying technology is imported, including some $200 billion of annual semiconductor imports. China accounted for 17 percent of ASML’s 11 billion euros in sales last year. This production push got a lift from the U.S. Commerce Department’s move last year to ban Chinese telecoms equipment maker ZTE Corp. from buying American-made components. Though the embargo attempt fell through, the threat such a prohibition would have posed to domestic output is a lesson that has been learned. If China wants to have a standalone semiconductor industry, then it also needs to gain proficiency in the equipment needed to make the chips. One reason it can’t just buy this is that there’s a limit to how many EUV machines ASML can produce: it expects to ship just 30 such systems in 2019, up from 18 last year. The same goes for other lithography equipment. But if there was any doubt about how serious China is about silicon independence, the allegations about the ASML theft, if true, will surely dispel it.